Here are highlights on climate contrarians or deniers, sometimes called climate skeptics (or "faux skeptics"). Generally the contrarian/denier arguments are scientifically invalid or irrelevant. Right-wing media and politicians use contrarian arguments as weapons to promote the libertarian/fossil fuel agenda to oppose sensible climate risk management action. For the full version with more details click HERE. What is the contrarian agenda? What do contrarians say about global warming? What about real scientific skepticism and contrarians? What are some contrarian tactics and logical fallacies? What about "fringe" contrarian ideas? Aren't there some contrarians with credentials who disproved mainstream climate science? No. What do contrarians misunderstand about climate risk management? What are some disturbing elements regarding contrarians? Why do we hear so much from the contrarians? Are the scientists hitting back against the contrarians? What is the psychology used by contrarians? Where do contrarians get FUNDING? What about the Right-Wing Connection to contrarians? What about a Contrarian Quote? Where can I get more information and references on contrarians? What about a little humor? The "contrarians" or "climate-change deniers" are a loud vocal minority. They include some scientists, who however mostly are not professional practicing climatologists; there are a few contrarian climatologists. HERE is evidence that contrarians in general have far less expertise in climate science than mainstream climatologists. The conservative MIT climatologist Kerry Emanuel labels contrarians as "mavericks" and "charlatans", see HERE. Some contrarians are politically or financially motivated. Contrarian media and (mostly right-wing) politicians regularly push contrarian information to further their agenda; see next. The agenda for at least some contrarians is to derail meaningful discussion and action on global warming by sowing confusion and influencing public opinion. Right-wing media using contrarian material have succeeded in blocking substantial climate risk management action using this tactic. Some contrarians do not have an overt political agenda but rather have an incomplete understanding of the relevant science. Various contrarians hold mutually inconsistent beliefs and positions. There are four basic categories. Each illustrates a separate contrarian fallacy. #1. "No Global Warming": Some contrarians deny that recent global warming exists (they distort the meaning of global warming, which is a globally-averaged upward temperature trend seen in the data since 1975, and instead invoke irrelevant short-term fluctuations). #2. "Little or no human influence": Other contrarians do admit that recent global warming exists but claim it is not largely caused by humans (they ignore or distort the attribution provided by climate models, and they emphasize irrelevant data). #3. "No harmful impacts": Still other contrarians admit both that recent global warming exists and that it is largely caused by humans, but deny harmful impacts now or in the future (they ignore expert reports). #4. "Too expensive to act": Some contrarians admit that global warming exists, is caused by humans, and indeed has harmful effects, but assert that it is too expensive to mitigate global warming (they ignore the principle of risk management, use economic scenarios that ignore benefits of new technologies, assume a high "discount rate", and ignore devastating future economic costs of unbridled global warming). Variations exist for contrarians in all these categories. Common contrarian end goals are opposing climate risk management and stopping effective climate action. References: #1. "No Global Warming": HERE and HERE. #2. "Little or no human influence": HERE. #3. "No harmful impacts": HERE, HERE, and HERE. #4. "Too expensive to act": HERE. Scientists, by nature, are skeptics. It takes a long time, with evidence from many sources, and with peer-reviewed journals as a filter, for scientists to become convinced. However, once a scientific result becomes established, contrary claims are treated with with the same skepticism. Contrarians misinterpret this fundamental aspect of science. Some of them misrepresent scientific standards by complaining that their ideas are suppressed by a "scientific establishment". The contrarian pseudo-scientific product often resembles Feynman's "Cargo Cult Science". Sometimes this is because of an incomplete understanding of the relevant science. Indeed, some contrarians seem to misunderstand the very nature of science, which consists of a web of facts and theory, different from a mathematical "proof". Also, science is not equivalent to legal argument. This false, deliberate confusion of science vs. mathematics or science vs. legal argument is a prime contrarian tactic and fallacy. Many contrarians and contrarian media routinely engage in various distortions of science, data, and logic. 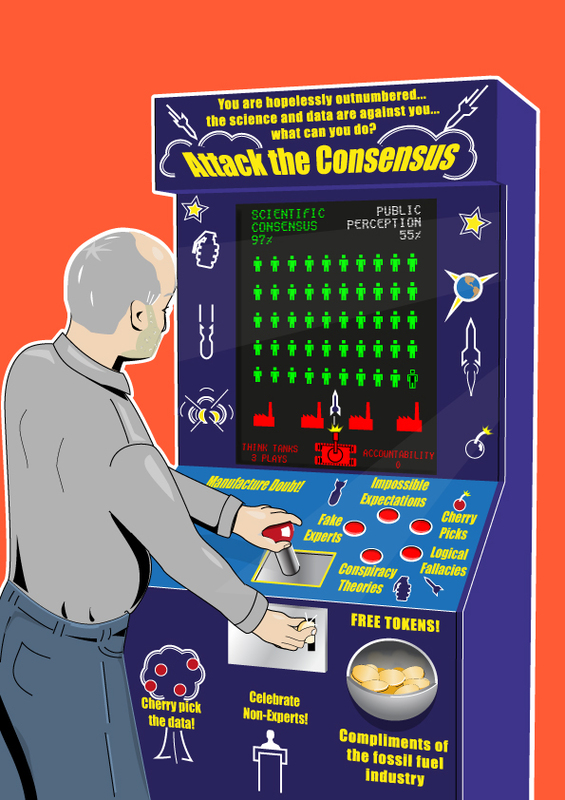 Their tactics and fallacies include ignoring or distorting mainstream scientific results, cherry-picking data and falsely generalizing, bringing up irrelevant red-herring arguments, demanding unachievable "precision" from mainstream science with the motif “if you don’t understand this detail you don’t understand anything”, overemphasizing or mischaracterizing uncertainties in mainstream science, engaging in polemics and prosecutor-lawyer Swift-Boat-like attacks on science - and even scientists, attacking the usual scientific process, misrepresenting legitimate scientific debate as "no consensus", and overemphasizing details of little significance. Contrarians generally will not admit they are wrong or that they could be wrong, even when presented with evidence that they are wrong. Real scientists will change their minds when presented with scientifically convincing evidence. Contrarians routinely present "evidence" in non-scientific ways, taken out of context, falsely generalizing, that is not scientifically convincing. Some contrarians are skilled debaters and love publicity of debating in front of audiences. Generating doubt and confusion is the tactical goal of contrarians in wanting debate, because confused people will not act on climate, and a main end goal of contrarians is to prevent responsible climate action. Contrarian fallacies can be in any of the four categories (#1. "No Global Warming", #2. "Little or no human influence", #3. "No harmful impacts", #4. "Too expensive to act"). There are examples backing up all these statements; see the references below, and in particular RealClimate's critiques of contrarian claims. HERE is another good description. Fringe contrarian ideas constitute a difficult and potentially confusing topic. A fringe idea is generally off the established science track but not a-priori obviously wrong. Fringe ideas can a-priori turn out to be true or false. For an introduction to fringe science, see HERE. We first need to keep separate the originators of contrarian fringe ideas from the (mostly right-wing) media and politics using contrarian fringe ideas as a weapon to push a mainly pro-libertarian/fossil fuel agenda and oppose climate risk management. A few contrarians constructing fringe ideas have real climate science credentials. More details are HERE. There is a big difference between a "basic" fringe climate idea with the intent to displace or minimize the well-established dominant greenhouse gas cause of recent global warming, and a "detail" fringe idea regarding some detail of climate science, keeping the dominant greenhouse gas warming mechanism in place. Some contrarian claims (usually made by people with few or zero climate science credentials) are so grossly wrong with flagrant errors that they cannot be said to achieve even the status of fringe ideas; these ideas simply constitute pseudo-science. For an introduction to pseudo-science, click HERE. Many examples of climate fringe ideas and pseudo-science with responses can be found on skepticalscience.com and on RealClimate.org. BOTTOM LINE: The problem is not really with climate contrarian fringe ideas. The real problem is that contrarian media/politics distort the scientific process for climate by regularly trumpeting contrarian fringe ideas and pseudoscience with the tactic of attacking established climate science. The underlying contrarian media/political strategy is to push a right-wing pro-libertarian/fossil fuel agenda goal and fuel opposition to climate risk management action. What are "Appropriate Climate Credentials"? There are some - actually only a few - contrarians with appropriate climate credentials. Appropriate climate credentials means holding a position in climate science at a respected university or lab and having done substantial research published in respected peer-reviewed climate journals. For example, weather reporters do not generally have expertise in climate science. Most physicists, most engineers, most geologists, and most mathematicians do not have appropriate climate credentials. Some contrarians (like C. Monckton, pictured above) have no scientific credentials at all. NOT "disproving" mainstream climate science: First, science is not mathematics and cannot be either "proved" or "disproved". Second, the arguments made by those few contrarians with appropriate credentials do not actually attempt to attack the main fundamentals of climate science. What they do is to search for arguments minimizing the amount of future global warming/climate change and/or minimizing the amount of past global warming/climate change attributable to humans. These contrarian arguments have been singularly unsuccessful, e.g. containing major flaws or unsupported claims or being in contradiction with data. Essentially the contrarian arguments constitute "fringe science", discussed above. Bottom Line: Any field of science has its mavericks arguing against the prevailing scientific paradigms. The scientific process and data weed out the arguments. The real problem here is not the contrarian arguments per se. The problem is that right-wing media and politicians use contrarian arguments as weapons to argue against acting responsibly for risk management of climate change. We have seen the tactics of climate contrarians before with cigarette propaganda tactics, as noted HERE: "An identical strategy succeeded in delaying government action against tobacco companies for years despite overwhelming evidence of the hazards of cigarettes". HERE is a University of California paper using the words of the tobacco industry, including this on page 9: "A demand for scientific proof is always a formula for inaction and delay". The same tactic is used by climate contrarians. Convincing evidence documenting the ties between the tobacco attack on medical science and the climate contrarian attack on climate science is in the second half of the video "The American Denial of Global Warming" by Naomi Orestes. Climate Risk Management deals with mitigation and adaptation as procedures to ameliorate the risks of future impacts of global warming / climate change. To do risk management in any setting, risk estimation must first be carried out. This requires the best available input, including models, scenarios, and statistical analysis. By definition, risk includes uncertainties. The 2007 IPCC reports and other expert reports summarize the best available information for a sensible climate risk-management framework. Contrarians misunderstand (either by omission or deliberately) all aspects of climate risk management. First they mischaracterize expert information for input to risk management. Instead they propagate the message "there is no climate risk". Contrarians have absolutely no evidence for this statement. Also notice that "no risk" has "no uncertainty", so contrarians essentially oppose risk management for uncertainty. This is inconsistent. Risk management is largely about coping with uncertainty. Contrarians and their media outlets routinely denigrate scientific forecasts of harmful effects of global warming as "alarmist". Above all they oppose any sensible proposals of risk management of harmful climate impacts. Naturally, risk management comes with a price tag. Ignoring risk management comes with a price tag also. Contrarians overemphasize the price of risk management, and under-emphasize the price of ignoring risk management. HERE is a professor who says: "At the American Association for the Advancement of Science meetings last month in San Diego, I was amazed at the number of my mild-mannered scientific colleagues who admitted, in private conversations, the pressures and/or threats they've received." There are other such examples; they are not pretty. What about the Hacked Emails? The hacked email "climate-gate" incident, without content scientifically, was persistently distorted by right-wing media in a destructive frontal attack on climate science and climate scientists. The definitive rebuke to the attempt by right-wing media to exploit this incident was provided in the exhaustive Sir Muir Russell report, which emerged after six months of inquiry, clearing scientists in the "climate-gate" affair. HERE is the full report. The professional climate website RealClimate has a description. "The climate scientists at the centre of a media storm were today cleared of accusations that they fudged their results and silenced critics to bolster the case for man-made global warming. Sir Muir Russell, the senior civil servant who led a six-month inquiry into the affair, said the "rigour and honesty" of the scientists at the world-leading Climatic Research Unit (CRU) at the University of East Anglia (UEA) are not in doubt. They did not subvert the peer review process to censor criticism as alleged, the panel found, while key data needed to reproduce their findings was freely available to any "competent" researcher." The MIT climatologist Kerry Emanuel wrote a very hard-hitting essay: "Climategate": A Different Perspective. Emanuel castigates the right-wing attack on climate science that uses the pretext of the hacked emails and minor IPCC report errors. The IPCC is described HERE. The IPCC reports consist of accounts of the best up-to-date scientific and economic research on climate change and global warming. The 2007 IPCC reports contain 3000 pages in 3 volumes. These are excellent reference sources. A few isolated minor mistakes however exist, notably one paragraph on glaciers in the Impacts 2007 report (not the science report). This was used as a pretext by right-wing contrarian media to manufacture a destructive attack on the entire IPCC structure. Actually, the IPCC has been under attack for many years by right-wing contrarians. It should be noted that no human endeavor is guaranteed 100% error-free; nitpicking was used as a lawyer-prosecutor tactic exploiting minor mistakes to attack the IPCC and climate science in general. For analysis, see RealClimate's discussion called "The IPCC is not infallible (shock!)". More RealClimate analysis is at: "IPCC errors: facts and spin". HERE is the analysis of the Union of Concerned Scientists. HERE is documentation of misreporting on IPCC coverage of rain forests. The few minor glitches in the IPCC reports should be contrasted with the contrarian product, which is full of glaring errors. While the history of science is littered with discarded or crank ideas, contrarians producing such ideas today have the unprecedented advantage of being supported notably by powerful energy and right-wing libertarian interests. The media, in order to "present both sides", gives the contrarians unwarranted coverage. In addition there are contrarian Internet bloggers, right-wing politicians, and some influential newspaper editors and TV “news” shows that present only contrarian arguments. HERE is the way one professor put it: "What really bothers me is the stunning lack of balance in U.S. media reports on climate science. In Europe, newspaper coverage gives a pretty accurate reflection of what the leading scientists are saying. In the U.S., the scientific findings are “balanced” against the views of people who know how to spin juicy quotes but can’t even spell “climatology.” When the Intergovernmental Panel on Climate Change releases a major report, its main conclusions get a few stories, while most of the attention goes to small errors that don’t affect its substance – and that show up about once every 1000 pages." The right-wing media chronically and blatantly distort climate science. Moreover, media inaccuracy on climate has been moving into the mainstream. Here is a RealClimate article discussing a recent example of misleading media, through incompetence or intent or both; see also "Whatevergate". Part (although not most) of the problem is the chronic inability of scientists to communicate in a simple effective fashion with the media and the public, as discussed HERE. Prof. Andrew Weaver, the Canada Research Chair in Climate Modelling and Analysis at U. Victoria, filed a lawsuit against the right-wing newspaper The National Post, over a series of libels based on falsehoods went viral on the Internet. Coverage is not all bad; here is one positive story. RealClimate reported that the Sunday Times (UK) retracted a story by Jonathan Leake on a supposed ‘Amazongate’ and published an apology. This is in response (see HERE) to an official complaint to the Press Complaints Commission by Simon Lewis, an expert on tropical forests at the University of Leeds, over the above "inaccurate, misleading and distorted" newspaper story; the story falsely reported a supposed mistake made by the IPCC . Yes. HERE is an extraordinary letter published in the journal Science, signed by 255 members of the US National Academy of Sciences, including 11 Nobel Prize laureates. It says: "Many recent assaults on climate science and, more disturbingly, on climate scientists by climate change deniers are typically driven by special interests or dogma, not by an honest effort to provide an alternative theory that credibly satisfies the evidence." Further, "We also call for an end to McCarthy-like threats of criminal prosecution against our colleagues based on innuendo and guilt by association, the harassment of scientists by politicians seeking distractions to avoid taking action, and the outright lies being spread about them." The Union of Concerned Scientists UCS has announced a program to organize scientists from around the country to beat back misinformation and educate decision makers and the public about the real facts on global warming. What is the Psychology Employed by Contrarians? Fallacious tactics used by contrarians constitute a deliberate psychological agenda to influence the public. HERE is an excellent essay that says: "People are only too happy to accept a message of denial: you do not need to change, it will all be fine". A Greenpeace report "Koch Industries: Secretly Funding the Climate Denial Machine" is described HERE, and the report can be downloaded HERE. HERE is a smoking-gun 1998 document from the American Petroleum Institute detailing a plan to influence public opinion by sowing doubt about the science, complete with multi-million dollar budget figures. What about the Right-Wing Connection with contrarians? HERE is an editorial in Nature Magazine entitled: Science Scorned: The anti-science strain pervading the right wing in the United States is the last thing the country needs in a time of economic challenge. HERE are the results of a Gallup poll showing most conservatives doubt that global warming is even occurring. To give an idea of the rampant distortion of climate science by contrarian media, HERE is a popular right-wing blog that states: "Another global warming myth comes crashing down. No warming since at least 1995, no melting glaciers and now no rising sea levels. Basically this leaves the warmers with no credibility..." All these assertions are simply wrong. HERE is a list of contrarians and what they say. HERE is a list of contrarian links, organized by topics. HERE is background information on contrarians. HERE is a list of contrarians with reference links. * Reference: Prof. Richard Feynman's famous talk, "Cargo Cult Science". Where can I get More Information on Contrarians? The most complete resource is RealClimate's Wiki, which is “an index for debunking of various popular media occurrences of climate-related nonsense”. HERE is the list of responses to common contrarian arguments at RealClimate. RealClimate is the go-to scientifically accurate website run by professional climatologists. Other excellent sites debunking contrarians include Skeptical Science and Coby Beck’s How to Talk to a Climate Skeptic; these sites have organized lists of contrarian arguments and responses. More useful information refuting contrarian claims is at the UK Met Office, the Union of Concerned Scientists, Deltoid, deSmogBlog (which has a LIST of contrarians with background information), Grist, Prof. Stephen Schneider's website, NERC, EDF, Island of Doubt, and Climate Progress. A very long and detailed response to myriad contrarian attacks on the Environmental Protection Agency made during the EPA's public hearings in 2009 is HERE. Go HERE for more reference links. Various contrarians, mostly without professional climate science credentials, assume the role of a climate scientist and mangle the science. As emphasized by the climatologist Kerry Emanuel HERE, "a whole host of charlatans posing as climate scientists" now exists. Think of medical quacks. Sometimes the contrarian is a scientist paid by the fossil-fuel industry (see HERE) - think of tobacco scientists who claimed tobacco wasn't dangerous. Right-wing think tanks fund some contrarians (see HERE). A few contrarians with credentials promote fringe ideas that either do not have convincing evidence or are flawed outright. Layered with distorted commentary and op-eds, contrarian pseudo-science and fringe science is broadcast in lockstep on the powerful right-wing media machine: TV, radio, newspapers, and blogs. The contrarian goals are to sow confusion and doubt, hamper mitigation efforts, attack legislative attempts for climate change risk management, oppose greenhouse gas regulation, and fight a climate treaty. Humor? See Stephen Colbert's video of Fox News (at 2:43) saying winter snowstorms "disprove Al Gore's theory of global warming". Colbert uses the same cherry-picking "logic" to "prove" - because it is nighttime - that the sun has been destroyed. Whose picture is at the top of the page? It's the right-wing contrarian Christopher Monckton, see HERE.